California has best hot springs in the world (I know it's stretch) in terms of availability of the primitive hot springs. Unlike other countries, California's hot springs are mostly locating in public lands (BLM lands or National Parks, National Forests) so it's been naturally preserved without developer's touch fortunately. Especially in the east side of Sierra Nevada Mountains, there are plenty of unspoiled natural hot springs as free and plenty as free birds. The region is a hotbed of constant seismic and volcanic activity that attracts many brave souls who loves to enjoy the paradoxical phenomenon of fire and hot water. Throughout California, there are many primitive hot springs thanks to the ring of fire and San Andreas faults and many other unusual geological activities. California have from the south; Holtville near Calexico few miles north of Mexico border, Aqua Caliente about 100 miles west of San Diego in the middle of beautiful Anza Borrego desert (http://www.sdcounty.ca.gov/parks/Camping/agua_caliente.html), Beverly Hot Springs Spa (http://www.beverlyhotsprings.com/index.html) which is only mineral hot spring in city of Los Angeles in the middle of Korean town, Desert hot springs (http://www.dhsspa.com/) area has over 30 hot springs (wonder why they call it desert with so many springs) near Palm Spring, Deep Creek in Apple Valley (tough hike believe me), Sespe in Ventura (4 hours of walking and there'sno water zero zip), big caliente and little caliente in Santa Barbara inside Los Padres National Forest, Saline Valley hot springs in Death Valley (4 hours of desert drive, no pavement this is not for faint heart), Mono hot springs in Ansel Adams Wilderness which requires about 3 hours of hiking, Big Sur hot spring (http://www.bigsurcalifornia.org/hotsprings.html), Sycamore (http://www.sycamoresprings.com/) and Avila hot springs near San Luis Obispo, Mercey hot springs near Hollister and I-5 (http://www.merceyhotsprings.com/about_mercey.html), and many other hot springs in Northern California which most of them are well developed and and charging some people's monthly salary for entry and one night soaking. I don't want to mention names of those places because I believe the hot springing should be like finding treasure in the nature and shouldn;t requires entry fees or very minimal fees for bare operation purpose. Eastern Sierras provide best and most primitive hot springs. Along the hwy 395 there are so many hot springs including ones in the long vallet caldera and travertine in Bridgeport, Buckeye Hot Spring in Toiyabe National Forest, just north of Bridgeport. According to hotspringsenthusiast.com (http://www.hotspringsenthusiast.com/California.asp) California has 304 hot springs and it's second only to Nevada for numbers of hot springs. But in terms of quality and accessibility, CA has much better hot springs than any other states or country in the world; only counting primitive ones, not developed ones. if developed ones are counted then I may vote for Japan where they have over 20,000 hot springs or onsens are registered. Out of all these hot springs in California, no place near Mammoth lakes has more primitive hot springs in one place. The place is called Long Valley Caldera which is basically a dirt plate on top of volcano and supposely one of the largest on earth. The area is home of famous Hot Creek (party area since 60s) whic is closed now due to serious volcanic activities, Hilltop, Little Hot Creek, Crab Cooker, The Tub, Sheperds, and Wild Willyes. In and around the Mammoth Lakes, especially in the long valley area near the green church off highway 395 is the prime spot of volcanic yet best primitive hot springs in the world. Because of their seclusion and luckily government lands (actually it's our normal people's land), these tubs are considered as 'Private.' Approximately 10 miles east of the long valley, passing the Mammoth Lakes town, you can reach to the Red's Meadow's hot showers. These hot showers near the Devil's Post pile National Monument are free and great but it requires some hiking. During the winter season it's closed. The only way to get there is through Mammoth Ski area and they are closed. Hot Creek - in 2008, it was closed due to serious volcanic activities. Once the activities reduce to safe level then the authorities will reopen the facility so stay tuned. When it was open, you can stand in the middle of the cold stream then feel the hot water wooshing from the bottom of your feet for few seconds. The waters are heated from 3 miles deep (according to ranger there) magma then it mixes with the cold stream to make a perfect temperature hot spring. In Japan, Gunma prefecture, there's an onsen named Siriyaki which has a similar feature but to much lesser degree. The hot creek is like having an underwater geiser system in the river. As of end of 2009, the Creek is closed and it doesn't look like it's going to reopen anytime soon. Apparently, the creek shoots up to 6' high geiser sometimes and I also heard somebody got burned. Latest picture attached below. The Long Valley near Mammoth have many hot springs and most of them are lovating in either BLM or Forest service land meaning they are all primitive. Depend on time and season, some are closed but at least there are 3 to 4 sites are open all year long. These are: hot tub, crab cooker, shepherd, hilltop, crowley, and little hot creek. Amongst all, I prefer little hot creek because it has best view for one and the other reason is it's most secluded so one must know the place for sure and need better transportation such as SUV or high clearance than a regular car. Of course, car can get there but end up with lots of scratches and sometime one must reverse drive to pass oncoming vehicle. It's on very unpaved natural narrow road. This place's water is probably best one in the valley and the tempeture is well regulated by ingenious engineering of pipes to regulate and the view is excellent. Although I love the Little Hot Creek, the hilltop has most spectacular view of Sierra Nevada Mountain Range especially in the wintertime it gives you best hot spring view in the world. I've been around and been many other country's spectacular views while hot springing, there's no other place like this including Japan. Most of Japan's hot springs are developed (in fact all of them) and although it blanded in with nature itself, I never been any place like this one. If I'm wrong, please send me photos of link to the site to my email wasabi.ray@gmail.com. if and when you venture in to the long valley or any primitive hot spring, I strongly suggest taking 4 wheel drive SUV with plenty of water. The long valley is about 2500M high which is as high as (almost) most of European Alps mountains. This place is not easy to find and get to... it has some muddy water but I guess it's alright too. Lake Isabella area have several great hot springs but some of them are in the private property which requires owner's permit to reach. 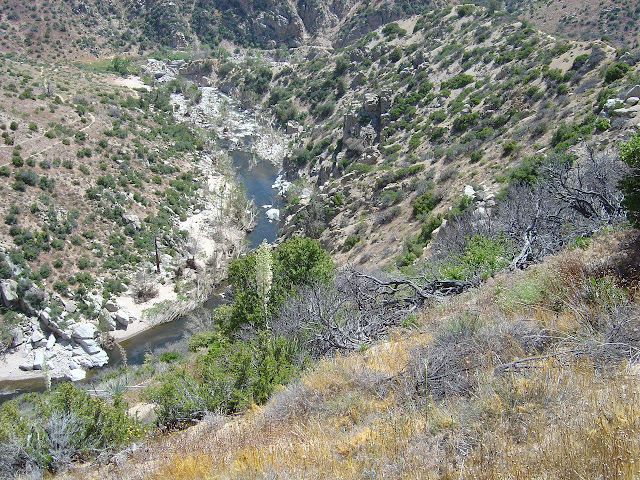 Over the years, several people made attempt to develop along the Kern river as resorts or hotels but all failed so some of those sites are still avaialble but in the private land. 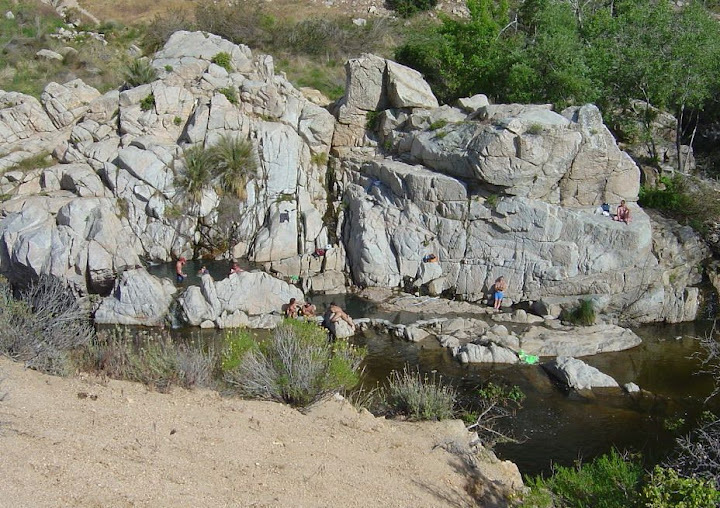 One of the best public primitive hot spring was the miracle hot spring where several cement soaking pools fed by natural hot spring just about right (100 to 120 degree depend on location) then you can cool off in the Kern river where you can swim along side beavers. However, due to the popularity (only few hours from Los Angeles), so many people jammed in to the small rocks area and caused safety problem so the land management sut the place down by bulldozing it, sadly. Right next to the hot spring was one of better camp ground in the entire Kern river area called Hobo camp ground which is managed by the Forest service. The hot spring's history probably goes back to ancient times and Indian tribal times but in modern time hostory the place was originally known as Compressor Hot Springs or Clear Creek Hot Springs and Hobo hot springs which derived from hobos who worked in the Borel power plant. Back in 20's someone leased land from the Forest service and built a serious hotel with therapists and nice rooms with hot bath but the hotel burned to the ground in 1975. Fortunaly, from the shut down Miracle hot spring, you can drive few miles south to find [still open] Remington hot spring which is in a beautiful setting on the Kern River. Remington Hot Spring is consist of 2 main pools where one is right next to the river and the other is few steps up hill from the large River pool. There are many locals who loves the hot spring so it seems always clean and the quality of the water is at best. Sometimes it gets flooded mostly in the summer after the rain but almost open 365 days a year. There are 3 more hot springs around Kern river valley; Democrat, Delonegha, and Scovern but they are all locating in private property so you may want to check before you visit them. Deep Creek is a God sent hot spring in the desert. Due to the short proximity (approximately 100 miles) from the one of the largest cosmopolitan in the world (L.A.), one can imagine that the place will be flooded by people but it's not. The main reason is that you can get there by car, you must walk about 1 hour in the desert to get there. On the way to Deep Creek. It's about an hour walk from the parking lot but very steep hill (about mile down and mile up... that's a huge elevation change). My dog got dehydrated one summer so I had to carry him out. I've also heard that many people dehydrated by not having enough water and many people shared them with water.... make sure you have anough water when you venture in to desert like this. A gallon may not be too much to carry. 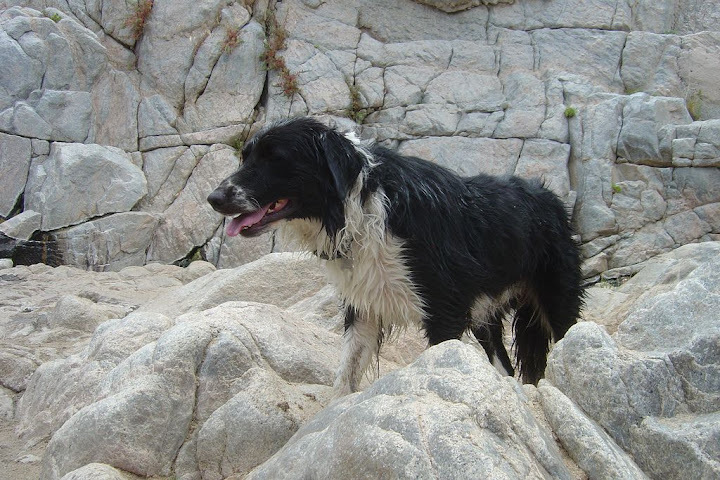 My hot spring buddy Archie Bunker - he likes to dip in hot spring and swim in the cold stream. Deep Creek from the other side of river view. You can cannon ball to the river and swim to cool off from the heat. The town is probably one of the prettiest around that area with many bed and breakfast inns plus bakery (what I've heard was that the baker actually maintain the tub and take good care of it.) The hot spring is locating behind hill of ranger station (Jack Sawyer rd) and if you look around you can find after driving about a mile. It's very easy to get to but no signs so you may want to ask locals about the tub if you are having hard time. This place is popular but due to remoteness of the location you can still enjoy without staying in line. There are two tubs in the hot springs. One is much nicer one and easy to get to from the road but the lower one has majestic view of Sierra mountains and especially when snows, it has spectacular view on it. The town was busy around late 1870s due to the near by mining town Bodie (ghost town of Bodie). It became a ghost town now but it must been one of the largest town during that time. 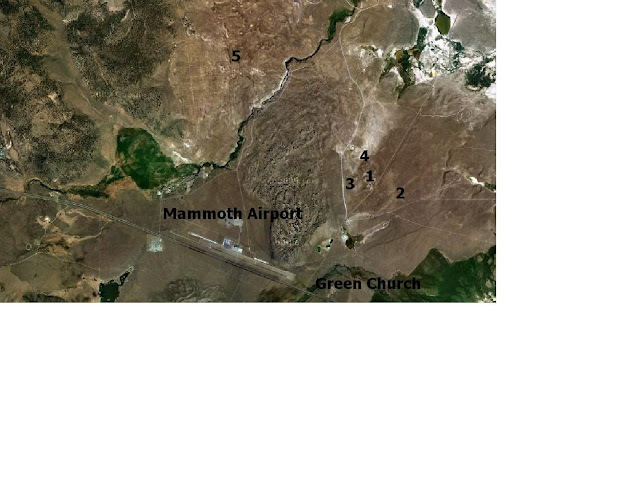 It's worth visit along with the Mono Lake which is not far from there as well. Keough hot spring is locating on the 395 near Bishop (8.5 miles South). It's North of Big Pine just off hwy 395 so make sure to watch a small road sign Keough Hot Spr. Rd all the way up to the resort. The resort (well developed but very primitive) is rather empty but the hot spring is very nice. It charges about $10 per person but not too bad considering using of huge hot water swimming pool. The thermal pool is well maintained and natural hot water was no doubt enjoyable. I wish they designed the facility more naturally assimilated with desert surroundings but oh well.... can't always get what I want. The Keough hot spring overflow run down the stream and creates several natural hot springs near by which are totally free if you prefer one. Many locals using the primitive ones and sometime it gets tough to get in. Near by Keough, locals enjoying the natural tub like this. Holtville is known as capital of Carrot north of US/Mexico border on I-8 near El Centro CA. The hotspring is locating next to palm surrounded desert oasis which fed by the natural hot spring. It's not well maintained but once volunteers clean up the place it becomes a desert oasis and hot spring especially in the middle of hot summer. This ares is well known for high heat which normally maintain above 115 degrees throughout the summer. 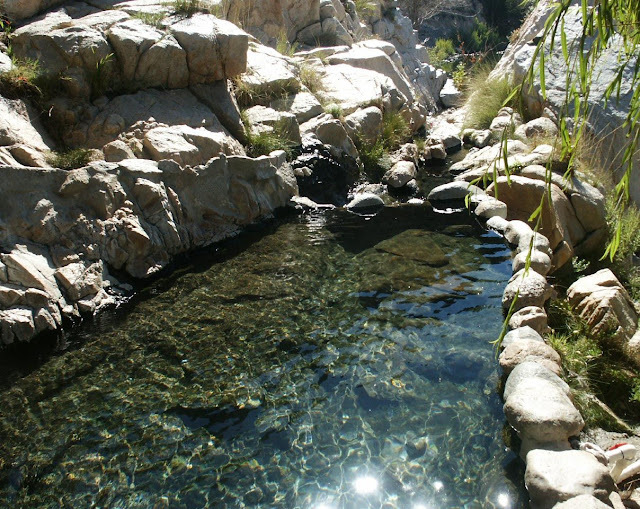 Near Palm Springs, there's not so known hot spring enclave called desert hot spring or DHS. DHS was established by Cabot Yerxa, who discovered hot water on Miracle Hill and built his homestead around it with genius adobe engineering in 1913 which is now serving as Pueblo adobe museum. Desert Hot Springs became a hot spring spa town in 50s with many spa hotels and attracted many people even away from Palm Springs. According to legend Al Capone was once hid in the spa hotel escaping from the Federal agents in Chicago. Today, DHS has over 50 small boutique spa hotels and private onsens. Central to the spa town is dhsspa which has best hot pools in town. Desert Hot Springs Inn - one of the oldest modern resort in Palm Springs area. Sycamore Hot Springs near Avila Beach, CA is one of the best developed hot springs in the U.S. It costs around $20 per tub for an hour but it's well worth it and sometimes without red\servation, can't get in !! It's well develped on the wooded hill and privacy is well guarded by wooden panels and natural obstables. This place is absoluetly best for lovers!